The scale of the solar system crushes me. And yet there we are, poking around and sticking our noses into it. We humans are pretty awesome. – OMG! They killed Mimas! Observations taken in the infrared by Cassini as well as from Earth show that the storm was not just big and violent, it also formed a vortex (a storm within a storm, if you like) that got hot – well, hot for frigid Saturn, that is. In the heart of the system, the temperature rose by an incredible 80° Celsius – a difference in temperature that’s like starting in the depths of winter in Anchorage, Alaska and then going to the height of summer in the Sahara! The image here [click to encronosenate] is from the Very Large Telescope in Chile, and was taken in the infrared, where the heat in the vortex is fairly obvious. Mind you, it’s not like it was a firestorm: the maximum temperature was still a chilly -150° Celsius, but compared to Saturn’s usual -220 or so degrees, that’s pretty dang hot. The rise in temperature was unexpected. A 20° rise is about the usual fare for these things, but then, this wasn’t a usual storm. Apparently, this hot spot started as two separate vortices, spawned by the storm seen in visible light, and moving around the planet at slightly different speeds. They eventually merged, forming this one ginormous vortex, which at its biggest was over 62,000 km (38,000 miles) across. Interestingly, it grew to this size around the time the visible storm had faded away. Like any planet with an active atmosphere, storms on Saturn are common, but one this big had never been seen before. I’d say it was fortunate that we had a spacecraft like Cassini orbiting the planet when the storm erupted, but luck had very little to do with it: it was hard work and dedication that gave us that view. Cassini is such a well-crafted machine that it has operated nearly flawlessly for over eight years orbiting the distant planet. Its design and launch took decades to complete, and it took another seven years just to get to Saturn in the first place. My point? Luck favors those who are prepared and have planned for rare circumstance. A storm like this one may not happen very often, but we were ready for it by having Cassini there in the first place, and by having a fleet of Earth-based telescopes with their eyes on the sky to support it. … and having said that, I’ll note an irony: although it was right there, Cassini didn’t discover the storm in the first place. Why not? Because there’s just too damn much to see in the Saturn system! The storm erupted rapidly, and Cassini was busy looking at the rings and moons, so it missed the storm’s genesis. This is not a failure on the part of Cassini or its designers and users: instead, it should be seen as a clarion call for more spacecraft, more explorers in our solar system observing all the myriad worlds. When I see images and science like this, I am filled with awe and joy, but I’m also struck with an implacable thought: what else are we missing? 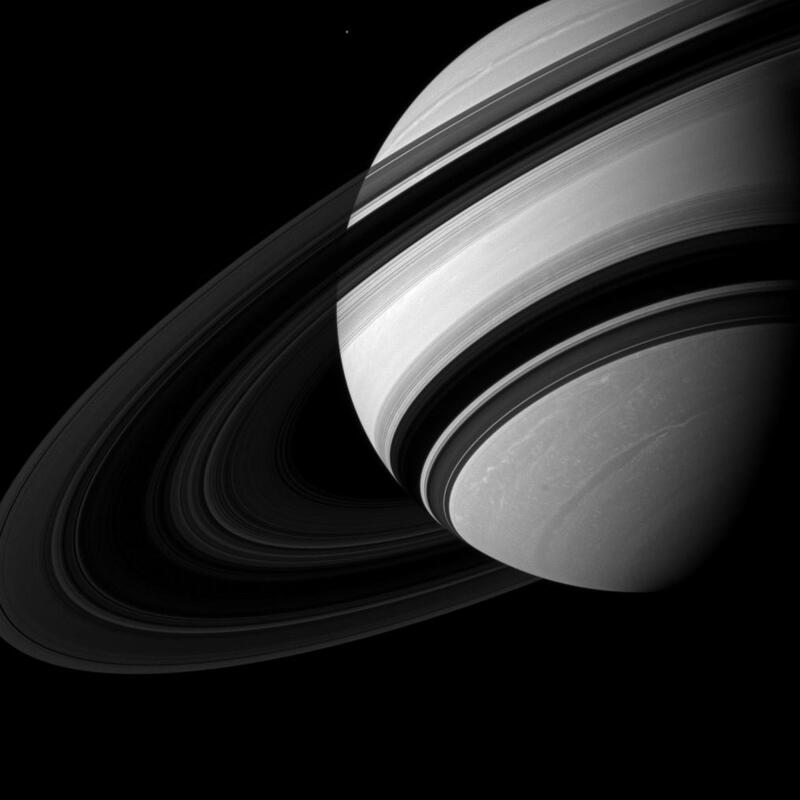 Pretty much every picture of Saturn sent back home from the Cassini spacecraft is devastatingly gorgeous, but it’s confession time: I prefer the greyscale ones to the pictures in color. This shot was taken earlier this year, in June, when Cassini was about 3 million kilometers from the planet. 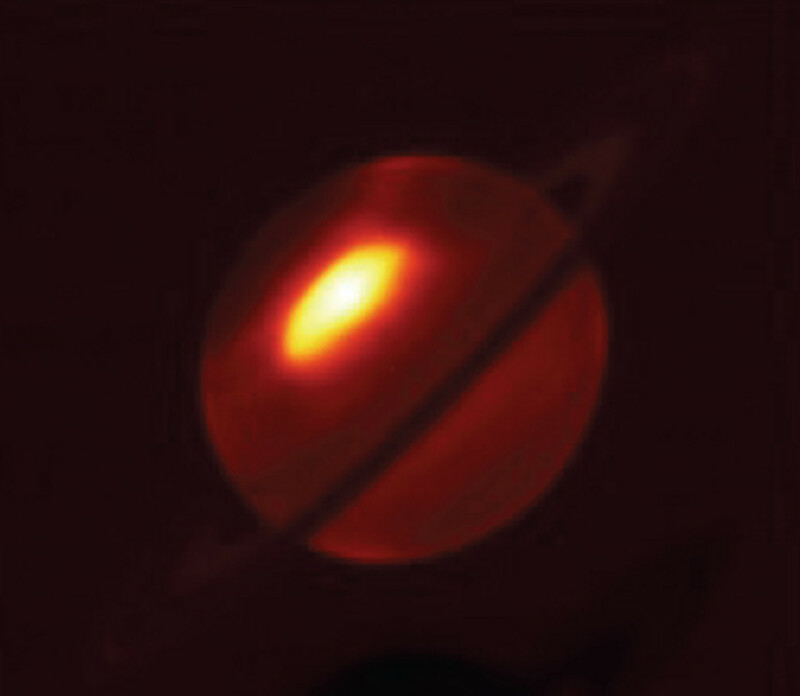 Saturn has a thick haze above its cloud tops, obscuring much of the details of the clouds below (one of the main reasons it doesn’t sport the same spectacular cloud bands as its big brother Jupiter), but this image was taken using a near-infrared filter – just outside the normal range of human vision (centered at 752 nanometers, for those who want details) – that can see some light that gets through the haze. The white spots and elongated features are the tops of clouds of ammonia, some of which are thousands and even tens of thousands of kilometers long. I love the angle on this picture. Cassini was south of Saturn’s equator, looking north. The northern hemisphere of the planet is edging toward summer right now, so the Sun is shining down on the rings, projecting their shadow on the southern hemisphere. We see the rings here from the unlit side, so they look a bit darker than you might be used to. However, since they’re made almost entirely of water ice, they’re transparent and scatter sunlight, so you can see them even from their shadowed side. As a bonus, you can also see the tiny moon Enceladus on the lower left. Of course, when I say "tiny", I mean the size of my home state of Colorado. This picture is jaw-droppingly beautiful, and I think a big part of that is that it’s greyscale (what some people call "black and white", which isn’t accurate since we see lots of shades of grey). While color images can be stunning, there is something about the contrast and chocolaty smoothness of greyscale that makes pictures like this more magnificent, more dramatic, and more brooding. I don’t know what it is – it’s the same phenomenon that happens with old movies, too – but for me it’s certainly a powerful effect. As if Saturn needs any help. In 2010, a storm erupted in Saturn’s northern hemisphere. It grew, and grew, and GREW, until it physically wrapped around the planet. At its peak it was 300,000 kilometers (180,000 miles) in length: 3/4 of the distance from the Earth to the Moon! The lightning flash can be seen in the image on the left, indicated by the arrow. It happened while Cassini happened to be using a blue filter, which is why it appears to be that color. The white and tan milky clouds are from the storm itself. The lightning has several analogies to storms here on Earth; the brightness was comparable to the brightest of terrestrial lightning strokes, and was produced in an atmospheric layer where water droplets freeze, like here as well. But bear in mind the scale here. The head of that storm you can see in the image here is roughly the same size as our entire planet Earth. Storms like this must happen every so often on Saturn, given the odds of us happening to see one just as we also happen to have a spacecraft there that can take a really good look at it. Always remember: when we gaze out at the objects in our solar system, and even beyond, these aren’t just static painting of long ago events, unchanging and forever frozen. They are actual worlds, dynamic and ever-shifting. And as alien as they are, there is always something analogous to Earth about them, something that will always remind us of, and teach us more about, our home. The mighty planet Saturn is circled by a fleet of moons, each as different from the other as individual people. And as weird and alien as it seems, this Saturnian system of planet and moons have some similarities to our own Earth and Moon. For example, as they orbit Saturn, the moons can be eclipsed by it when they pass behind the planet and into its shadow. That’s amazing [click to penumbrenate]. But it may not be obvious what you’re seeing at first! Enceladus is the moon to the upper left. It’s about 500 kilometers (330 miles) across, and its surface is almost entirely water ice. At the time this shot was taken, it was about 26,000 km (16,000 miles) from Cassini. If the moon were just sitting out there, half of it would be lit by the Sun, and half would be in darkness. Cassini was off to the side a bit when this was taken, so we see the hemisphere that is almost entirely lit by the Sun. The day/night line – called the terminator – runs from the upper left to lower right of the moon on its left side as seen here. But because Enceladus was partially into Saturn’s shadow, the sunlit side of the moon that would normally be painfully bright is dusky and dark. The shadow is deepest toward the bottom of the moon. The geometry of this scene depends on so many angles! The terminator line, the position of Cassini relative to the moon and Sun, the position of Saturn, and even the curve of the planet itself as its shadow envelops the moon. And we’re not done. Photobombing the scene at the lower right is the monster moon Titan, which is 10 times bigger in diameter than Enceladus! But it was over a million kilometers away from Cassini when this picture was taken, so it actually looks smaller than its very much smaller sibling. It appears dark, even compared to the shadowed Enceladus, because Titan only reflects about 1/5th of the light that hits it, while shinier Enceladus reflects almost all the light that impinges on its icy surface. Funny, too: the edge of Titan looks fuzzy, because it has a thick atmosphere. Enceladus has no atmosphere, but still looks a bit fuzzy as well due to Saturn’s shadow: the planet does have an atmosphere, so the shadow itself isn’t sharp. The complexities of understanding even a seemingly simple picture are ridiculous when that picture comes from Saturn. But that’s so often true: things do appear easy at first glance, but far more complicated when you peer more deeply. The Universe, as are human affairs, is rarely so black-and-white. The Cassini spacecraft has been orbiting Saturn since late 2004, and has spent most of that time more or less in the same plane as the rings and moons. That allows it to pass close to these interesting places and see them in high resolution. Things like this are seen at the poles of other words; Saturn itself has one, as does Venus. Titan also has a "hood" a haze layer over its north pole. That may be a seasonal feature, and right now winter is coming for Titan’s southern hemisphere*. Perhaps this vortex plays a part in forming the polar hood, and we’ll see one over the south pole soon. That’s not clear yet, but it may become so as Cassini continues to investigate this incredible system. It’s been there for almost 8 years, and we’ve barely scratched the surface of what’s going on. There’s a whole lot of real estate in the Saturn system, and it changes all the time. We could use 50 Cassinis stationed there, and it still wouldn’t be enough to gather up all the beauty and amazing slices of nature to be seen. – Watch out Titan! Vader’s onto you! If you told me it was Mimas, I’d be surprised… and I was when I saw it! But it’s true. Mimas is a 400 km ball of mostly ice (and some rock) orbiting Saturn about 180,000 km out. From this angle, Cassini was looking down at the north pole from a steep angle, and that’s not how we usually see it. This is how we usually see it! The giant crater Herschel dominates the face of the moon, giving it as definite Vaderesque feel. But in the big image the crater isn’t visible, so the landscape looks markedly different. This image was processed by Ian Regan, who notes that the blue band you can see around the edge of the moon is real. It’s a bluer region that wraps around the equatorial regions of Mimas, the origin of which is still something of a mystery. However, it does match the very odd thermal pattern seen by cameras on board Cassini, a pattern that makes Mimas look like a giant PacMan in the sky. Cassini takes so many pictures it’s ironically not surprising that some will be surprising. Still, when it comes to astronomy, surprises are fun. They’re also a chance to learn something — as I did since I didn’t know about the blue band. And I also learned that even a familiar place can look very different if you get a different angle on it. There are times when I see an astronomical image so powerful that I’m momentarily stunned, my brain kicked hard enough that all I can do is stare at it and soak it in. This astonishing image was taken on June 13, 2012 by the Cassini spacecraft when it was 2.6 million kilometers (1.6 million miles) from the ringed planet — that’s more than six times farther than the Moon is from the Earth. 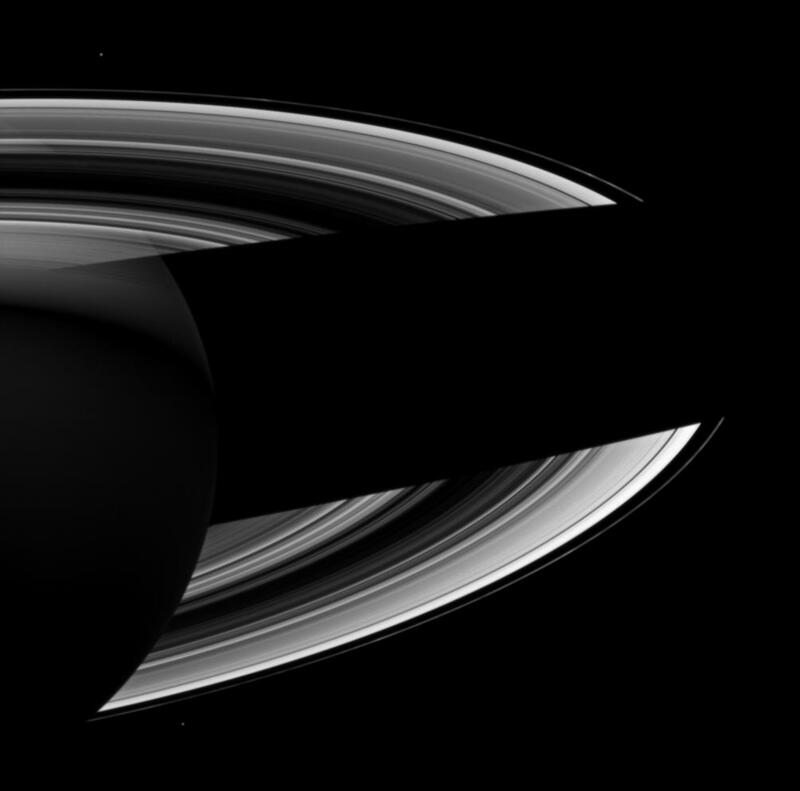 Even then Saturn’s rings span too broad a space to see completely. But artistically, perhaps, it works even better; their vast size is intimated instead of spoken aloud, the thousands of thinner component rings only hinted at. You can see their shadow on the tops of Saturn’s southern clouds thousands of kilometers below, the Sun shining down from the north — to the left as seen in this oddly-angled shot. The clouds themselves are almost featureless, but you can still see some boundaries between oppositely-blowing wind belts, and even the long, snaking remnants of a titanic storm that raged in the north last year. It’s incredible. Moreover, this image has not been processed in any way: it’s raw, taken right off Cassini’s detectors and sent home to Earth (I shrank it a bit to fit the blog, but otherwise didn’t touch it). The sky behind the planet isn’t entirely dark, there are a handful of hot pixels you can see on the planet, and there are other defects here and there that catch the eye. But even that takes nothing away from the power of this image to me, and in many senses actually adds to it. Cassini is out there. It’s well over a billion kilometers away from Earth and the Sun’s warmth, moving through space, enthralled by the deep and long-reaching gravity of this huge planet. Quietly, obediently, and with hardly any glitches or complaints, it takes picture after picture, reads and records the environment around it, saves the data, and then sends it via radio waves back to Earth, no more than a blue dot in its sprawling sky. This is what I see, this is how my mind reacts once my brain has a moment to compose itself. It’s a fantastic tableau, a static shot of a magnificent planet such a long, long way away. And always, when I see these, I also think: we did this. We flung this complex machine into the distant solar system to study Saturn, and we did it because we want to find things out. It is among the best things we do. Image credit: NASA/JPL/Space Science Institute. Thanks to Michael Interbartolo for posting about this latest batch of raw images in his Google+ stream. When I look at Cassini images of Saturn — with its multitude of rings and fleet of moons — I am inspired, moved, and even awed. And sometimes I laugh. When I saw this image, for example, I actually chuckled to myself. Why? This gorgeous shot was taken on December 30, 2011 and released just today as the Cassini Image of the Week. It shows Saturn’s gorgeous rings seen nearly edge on, and the tiny moon Epimetheus, only 113 kilometers in diameter, next to them. It’s a lovely image to be sure, and my very first thought was; I wonder if Epimetheus is closer to us than the rings, or farther away? If we’re looking down on the rings, from the north, then Epimetheus is closer to us. But if we’re looking up from underneath the rings, Epimetheus is on the other side of the rings. I could mentally switch my perspective back and forth, but I couldn’t tell which view is correct! This prompted my chuckle, as I wryly smiled at my brain’s confusion (I love optical illusions). So take another look: are we looking down on the rings, or up? Hint: the Sun is shining from the north, down on the rings. It’s a bit of a conundrum, isn’t it? Just by looking it’s almost impossible to figure out! If you’re familiar with Cassini pictures, the rings look subtly different if they are illuminated from above and you’re looking at them from underneath, and vice-versa. But it’s hard to tell. And to be honest, I wouldn’t have known without reading the caption for the image. The answer is we’re looking up. The Sun is shining down on the top of the rings, and we’re looking up from underneath, putting wee Epimetheus about 1.5 million kilometers (900,000 miles) from Cassini when this picture was taken. If it helps, hold up something round like a DVD and look at it from underneath. As another helpful guide: in the image above, the part of the rings at the top of the picture are closest to you, the bottom farther away, and Epimetheus father still. And I bet that even knowing that, some of you are having a hard time picturing it. Our brains are funny things, easily fooled when there’s symmetry in a picture, especially when that picture shows an unfamiliar object. I’m sure Carolyn Porco can just glance at something like this and figure out everything she needs to understand the geometry! I’m not so sure I could’ve. Remember: seeing isn’t always believing. It’s easy to fool our eyes and brain, but in the end the Universe knows what it’s doing.